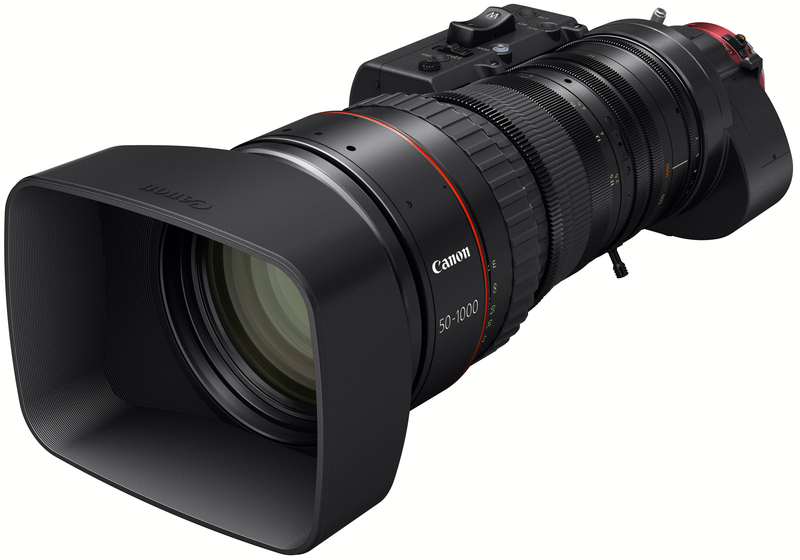 MELVILLE, N.Y., October 16, 2014 – With the increasing use of large-format single-sensor 4K cameras for field productions like sports and nature documentaries, Canon U.S.A., Inc., a leader in digital imaging solutions, has introduced the new ultra-telephoto CINE-SERVO 50-1000mm T5.0-8.9 Ultra-Telephoto Zoom lens. With the world’s longest focal length (75-1500mm with its built-in 1.5x extender) and highest (20x) magnification among Super 35mm zoom lenses,* new possibilities for shooting scenes in HD, 2K and 4K on single-sensor cameras. The new Canon CINE-SERVO 50-1000mm zoom lens is an ultra-telephoto lens with superb 4K optical performance and a removable Digital Drive unit to accommodate either broadcast or cinema-style production. Available in either EF- or PL-mount, the new Canon CINE-SERVO 50-1000mm T5.0-8.9 Ultra-Telephoto Zoom lens leverages Canon’s decades of expertise in optical design, computer simulation, and advanced glass materials to achieve a balance of ultra-telephoto 4K optical performance and image brightness with a compact form factor of only 15.9 inches in length (PL version) and a weight of just 14.6 pounds. This combination of advantages provides outstanding aberration correction and high image quality extending from the center of the image to all edges. For professional users, this lens enables close-up 4K imaging of wildlife subjects or athletes while maintaining the physical distances necessary in such shooting situations. The CN20x 50 features a removable servo drive unit and supports 12-pin serial communication. Ruggedly built, the durable new Canon CINE-SERVO 50-1000mm T5.0-8.9 Ultra-Telephoto Zoom lens features a removable Digital Drive unit for traditional EFP-style (electronic field production) operation with a convenient zoom/rocker switch, programmable zoom and focus settings, and data connections for use with broadcast-type field/studio servo-demand controls for zoom and focus. Removal of the drive unit enables Cinema-style operation of the CINE-SERVO 50-1000mm lens, including clearly engraved barrel markings, an 11-blade iris to help achieve smooth “bokeh,” and compatibility with lens-support rods, matte boxes, and other cinema accessories. The new Canon CINE-SERVO 50-1000mm T5.0-8.9 Ultra-Telephoto Zoom lens is compliant with industry-standard camera-to-lens communication protocols to help ensure compatibility and maximum performance with multiple brands and models of 4K, UHD and HD cameras. These standards include 12-pin serial communication (common to major broadcast camera brands), Cooke’s /i Technology and Canon EOS-LENS data communication technology (employed by the EOS C500, EOS-1D C, EOS C300 and EOS C100 Cinema cameras). In the case of the Canon Cinema EOS system, precise lens data – including aperture setting – is displayed in the EOS camera’s viewfinder, as well as recorded in the video file as metadata along with the model name of the lens and the given focal-length setting. The new Canon CINE-SERVO 50-1000mm T5.0-8.9 Ultra-Telephoto Zoom lens integrates advanced broadcast-style operability features that Canon developed as a leading maker of HDTV lenses for major sports coverage, wildlife photography, and ENG (Electronic News Gathering). These features include servo control of focus, zoom, and iris settings via the lens’ removable Digital Drive unit. Ergonomically designed for operator comfort, the unit integrates a high-precision, high-resolution 16-bit microprocessor encoderlinked to a convenient zoom/rocker switch that provides immediate start-up. This encoder enables camera operators to smoothly zoom at a variety of speeds, from a very fast 1.5 seconds to a very slow 180 seconds from full-wide to full-telephoto. Additionally, the encoder is capable of transmitting accurate analog and serial data for zoom, focus and iris settings through the Drive unit’s 20-pin connector, allowing for this lens to be incorporated into most existing virtual imaging systems. Operators can also manually control focus and iris settings from the drive unit or use it to program focus, zoom position/speed, and iris settings if desired, allowing for precise, repeatable lens operation. A small LCD display on the drive unit displays current settings for operators. Focus can also be adjusted manually by rotating a knurled rubber collar on the lens. Combining both broadcast operability and the accuracy required by cinematographers, the lens features a 180-degree focus rotation angle. With environmental-performance capabilities that stand up to typically unforgiving broadcast sports and wildlife shooting environments, the lens employs a tough, optimal chassis structure, and is weather and shock resistant. In addition to its three 20-pin connectors, the drive unit also has a broadcast-standard 12-pin power connection for remote-control operation. The lens also utilizes 700mA of power. With its Digital Drive unit/hand grip removed, the new Canon CINE-SERVO 50-1000mm T5.0-8.9 Ultra-telephoto Zoom lens provides digital filmmakers with the advantages of its industry-leading 1500mm focal length (with 1.5x extender) and 4K optical performance. Facilitating cinema-style use, lens-barrel markings are clearly engraved in both feet and meters on both sides of the barrel, and focus indicators on the front side of the lens are marked on an inclined surface to make them easy to see from the back of the camera. Additionally, luminous paint is used for the scale display on one side of the barrel to help make the markings visually identifiable in the dark. Both 0.8 type and 0.5 type gear module focus accessories can be used, and gear positions support the use of a follow focus and all other standard electronic accessories. With a 31.4mm image circle, this lens will cover industry standard Super-35mm format sensors. A red alumite identity color is used for the lens’ mount area to indicate conformance with Canon Cinema EOS optical technology’s many outstanding features such as support for EOS-LENS data communication. A structure enabling the lens’ EF mount to be replaced with a PL mount, or vice versa (electrical system included), is also incorporated. This conversion upgrade can be provided at authorized Canon service centers. The EF and PL versions of the lens are designated CN20x50 IAS H/E1 and CN20x50 IAS H/P1, respectively. Above: CINE-SERVO 50-1000mm T5.0-8.9 Lens from Canon Pro on Vimeo. 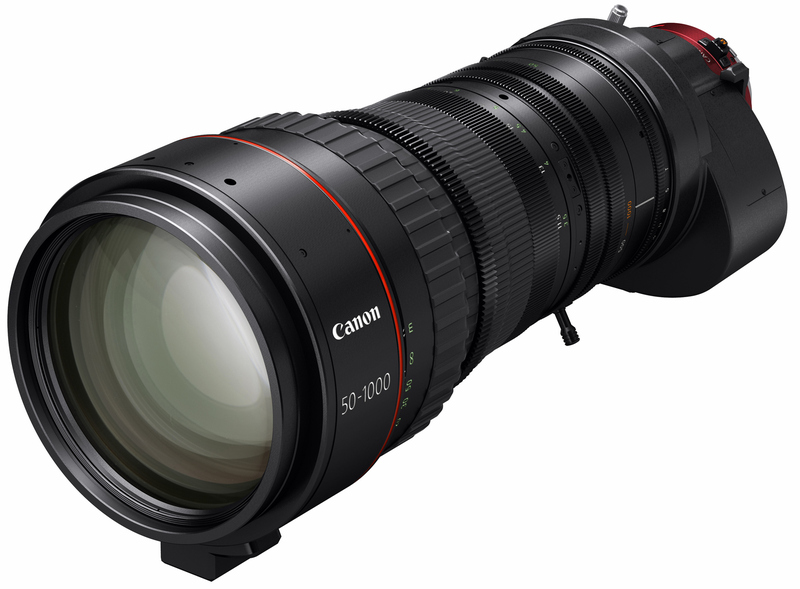 The new Canon CINE-SERVO 50-1000mm T5.0-8.9 Ultra-telephoto Zoom lens is expected to be available in the first quarter of 2015 for a suggested list price of $78,000. 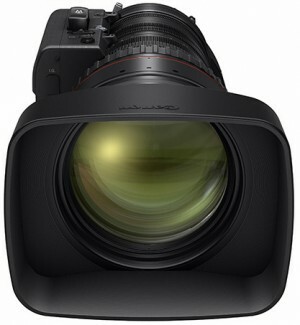 For more information about this new lens, please visit the Canon U.S.A. website at: usa.canon.com/cusa/professional/products/lenses/cinema_lenses/. Canon U.S.A., Inc., is a leading provider of consumer, business-to-business, and industrial digital imaging solutions. With approximately $36 billion in global revenue, its parent company, Canon Inc. (NYSE:CAJ), ranked third overall in U.S. patents granted in 2013† and is one of Fortune Magazine’s World’s Most Admired Companies in 2014. In 2014, Canon U.S.A. received the PCMag.com Readers’ Choice Award for Service and Reliability in the digital camera and printer categories for the 11th consecutive year. Canon U.S.A. is committed to the highest level of customer satisfaction and loyalty, providing 100 percent U.S.-based consumer service and support for all of the products it distributes. Canon U.S.A. is dedicated to its Kyosei philosophy of social and environmental responsibility. In 2014, the Canon Americas Headquarters secured LEED® Gold certification, a recognition for the design, construction, operations and maintenance of high-performance green buildings. * As of October 16, 2014.